Or better put, integrity is the highest form of loyalty. Integrity means being integrated or centered on principles not on people, organizations, or even family. You will find that the root of most issues that people are dealing with is “is it popular (acceptable, political), or is it right?” When we prioritize being loyal to a person or group over doing what we feel to be right, we lose integrity. We may temporarily gain popularity or build loyalty, but, downstream, this loss of integrity will undermine even those relationships. It’s like badmouthing someone behind their back. The person you are temporarily united with through badmouthing someone else knows you would bad mouth them under different pressures and circumstances. 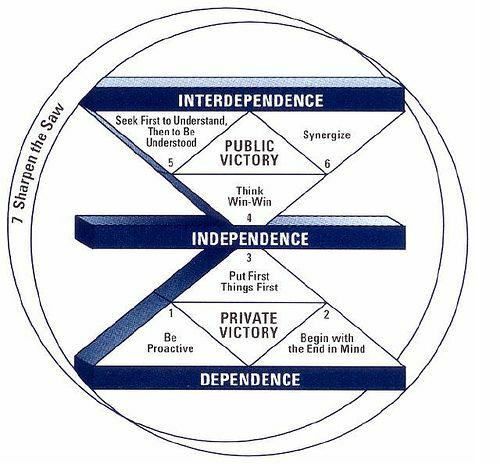 In a sense, the first three habits represent integrity and the next three loyalty; but they are totally interwoven. Over time, integrity produces loyalty. If you attempt to reverse them and go for loyalty first, you will find yourself temporizing and compromising integrity. It’s better to be trusted than to be liked. Ultimately, trust and respect will generally produce love. ← Are you looking for me? Very true, and they often go hand in hand. Thanks for the post!